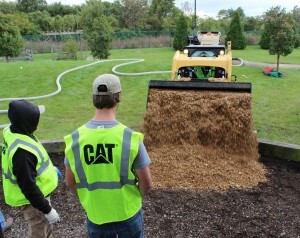 As part of PLANET Gives Back, a playground at Home of the Innocents gets new mulch. Photo: Sarah Pfledderer. As part of the third annual PLANET Gives Back, held Wednesday in line with the Green Industry Conference (GIC), nearly 75 volunteers revived the grounds at Home of the Innocents, a nonprofit shelter and pediatric convalescent center in Louisville, Ky.
Tasked with laying new mulch on a playground, planting around 25 trees, restoring a butterfly garden, planting cold crops in raised vegetable beds and installing irrigation systems for trees, volunteers dispersed into five groups to complete the project in its four-hour time frame, from 12 p.m. to 4 p.m. The volunteer project, PLANET Gives Back, began three years ago as a means to give back to the host city of the GIC and GIE+EXPO: Louisville. Home of the Innocents, he added, was a fitting nonprofit for the initiative because it could accommodate a hefty group of volunteers and was in need of restorations that would take about four hours. 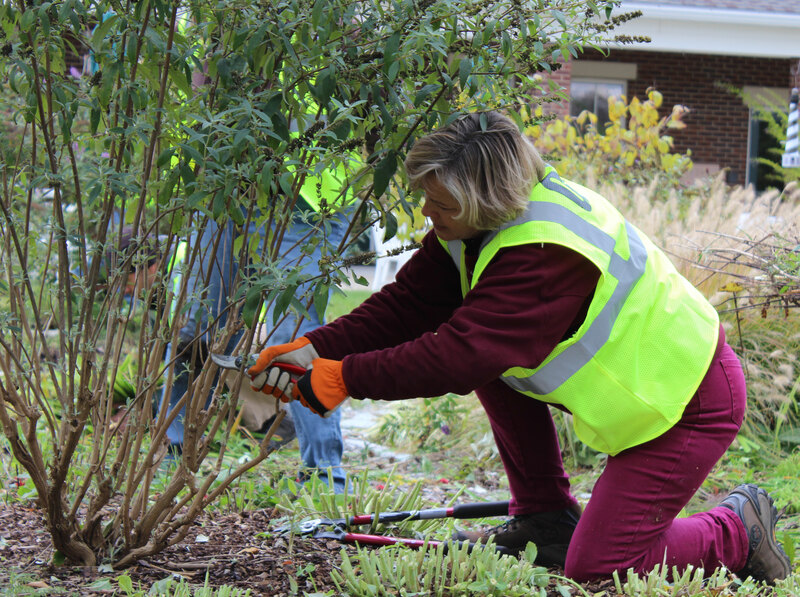 Martha Hill, with Hinds Community College in Jackson, Miss., uses pruning shears in the butterfly garden. Photo: Sarah Pfledderer. In years past, volunteers were faced with too large of projects to complete within the given time of the event, Fransen said. For that reason, local crews would complete the project in days following the occasion. “That’s what we’re trying not to do this year,” he said around 3 p.m. Wednesday—the project ended up being completed in its four-hour time frame, including cleanup. Several corporate sponsors supplied equipment for the project, including John Deere, Bobcat Co. and Finn Corp. On the supplies end, regional companies—such as Koetter & Smith—provided mulch and trees, among other products. It’s those donations, Fransen said, that pull together PLANET Gives Back volunteer projects year after year and provide nonprofits with wholesome landscapes.